MELVILLE, N.Y., Jan. 7, 2019 — (PRNewswire) — A versatile addition to the VIXIA G-series family of camcorders, Canon U.S.A. Inc., a leader in digital imaging solutions, today announced the Canon VIXIA HF G50. The camcorder is the first VIXIA G-series camcorder to feature 4K 30P recording and is an ideal tool for advanced amateur filmmakers, wedding videographers and student reporters. Featuring a genuine wide-angle Canon 20x (29.3-601mm)* optical zoom lens, the VIXIA HF G50 provides a well-rounded feature set at an affordable price point. "As filmmaking and videography continue to grow into a more ubiquitous medium of visual expression, it is imperative that creatives have products that help capture their unique vision," said Kazuto Ogawa, president and COO, Canon U.S.A., Inc. "Not only is Canon eager to view what our users create with the VIXIA HF G50, we are excited to be with them along the way as their skills and ideas further evolve into the future." The VIXIA HF G50 camcorder's Intelligent Optical Image Stabilization five-axis system Dual-Pixel CMOS AF provides users with powerful image stabilization via a Dynamic mode, which reduces image distortion even when shooting while walking. By adopting the 8-bladed circular aperture applying the EF lens technology, it is possible to take pictures using natural beautiful bokeh. 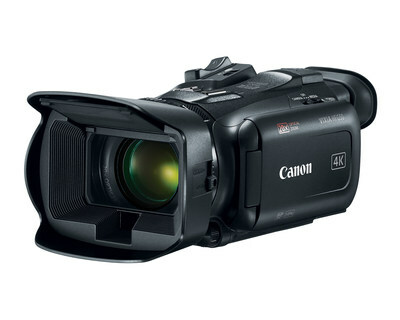 The ergonomically designed and highly portable camcorder has a 3-inch LCD touch panel screen and tilting, user-friendly, high-resolution color Electronic View Finder (EVF). Canon U.S.A., Inc., is a leading provider of consumer, business-to-business, and industrial digital imaging solutions to the United States and to Latin America and the Caribbean markets. With approximately $36 billion in global revenue, its parent company, Canon Inc. (NYSE: CAJ), ranks third overall in U.S. patents granted in 2017�nbsp; and is one of Fortune Magazine's World's Most Admired Companies in 2018. Canon U.S.A. is committed to the highest level of customer satisfaction and loyalty, providing 100 percent U.S.-based service and support for all of the products it distributes in the United States. Canon U.S.A. is dedicated to its Kyosei philosophy of social and environmental responsibility. In 2014, the Canon Americas Headquarters secured LEED® Gold certification, a recognition for the design, construction, operations and maintenance of high-performance green buildings. To keep apprised of the latest news from Canon U.S.A., sign up for the Company's RSS news feed by visiting www.usa.canon.com/rss and follow us on Twitter @CanonUSA. For media inquiries, please contact Email Contact.